Keynote speakers: Sandra Regina Goulart Almeida (Universidade Federal de Minas Gerais), Rosi Braidotti (Utrecht University), Bruno Latour (SciencesPo), Angela Mitropoulos (University of Western Sydney), Iris van der Tuin (Utrecht University). With participation of Marie-Luise Angerer (University of Potsdam), Irina Kaldrack (Braunschweig University of Art), Martina Leeker (Leuphana University Lüneburg) and Kathrin Friedrich (Humboldt University Berlin). We are immersed in matter, invaded by streams of living and technological subjects. Our bodies are exchanged, extended and interconnected in myriad different ways. The New Materialisms investigate the incessant materialization of the world. Matter is not a stable substance, neither localizable nor identifiable through clearly defined boundaries. Within both human and nonhuman environments, social and biological ontologies, everything exists in a constant state of change and materialization. The New Materialisms offer an alternative literacy with which to address the task proposed by the political consideration of the relations of difference, as well as those of divides. In the specific terms of feminist scholarship, this literacy has emerged as a »quantum literacy«, offering a significant turn for critical and creative discourses. Yet quantum literacy also possesses relevance beyond feminist theory, as a tool for all of those who are interested in conceiving more adequate terms for expressing knowledge production and the ethical terms of life and nature itself (Bühlmann, Colman & Van Der Tuin, 2016). The political agenda of this literacy offers a number of strategies for the conceptualization of entities and events (for example, migration and refuge; border control and actions of militarism; climate change and ecology), and for wider knowledge production across the sciences and humanities. As such, the New Materialist turn and its provocations coalesce as part of a paradigmatic shift currently occurring in the environmental humanities, and media and technology studies – across the humanities and the sciences – some of which are articulated under the concepts explored in post-capitalist, post-humanist, and post- colonial positions. Environmental Humanities and New Materialisms share an ethic of decolonizing nature and culture, as they depart from anthropocentric and constructivist positions. Our call is to consider ourselves as permeable, part of the ebb and flow of the Anthropocene, part of the »stuff of the world« (Alaimo, 2016). It is a call to investigate how climate change and the sixth great extinction are captured as scientific data, and to inhabit an environmentally ethical sense of matter within a world caught in the throes of change. New Materialist concepts of living matter upset conventional distinctions between matter and life, inorganic and organic, passive object and active subject (DeLanda, 2000). In Barad’s »Agential Realism« (2007), material agency does not privilege the human, just as for Bennett,»thing power« (2004) emphasizes the shared material basis and the kinship of all things, regardless of their status – human, animal, vegetable, or mineral. It is through this sense of mutual implication that the New Materialisms can contribute to an ecological ethos. 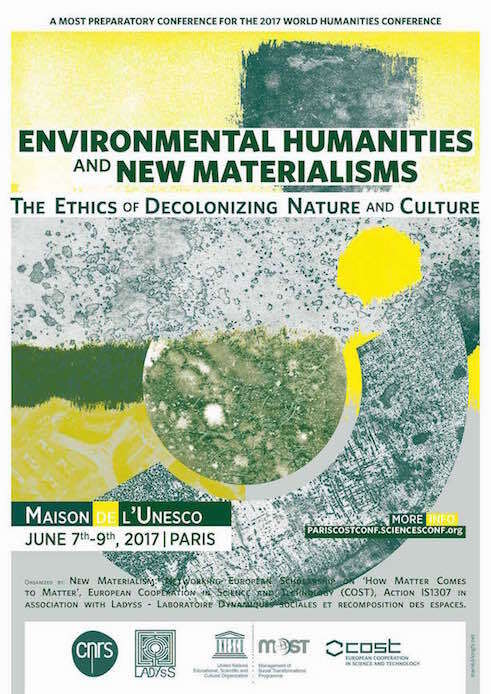 Our call is to consider the New Materialisms as an opportunity to enrich pre-existing conjunctions across environmental philosophy, environmental history, ecocriticism, cultural geography, cultural anthropology, and political ecology, including their debates as captured by the environmental humanities. These fruitful alliances could help build environmental posthumanities, as environmental humanists, activists and stewards work to reveal and reshape the flows of material agencies across regions, environments, animal and human bodies.